Don’t miss this opportunity to enjoy a wonderful lunch with friends and a great Littleton restaurant! Breckenridge Brewery has opened a new restaurant on Santa Fe and we are going to try it out! This is a little bit different format than a regular brewery. The menu has many down-home type choices and higher end choices! This is not your normal brewpub menu! Please take a moment to peruse the menu in your building’s book. Lunch is on your own. If you cancel within 24 hours of the event, you will be responsible for a $5 cancellation fee; $10 if it is a 2-van event. Please sign up in the Birch dining room to be a part of this event. Come and enjoy creating a cute Easter Bunny door hanger just in time for Easter! Using Styrofoam rings, tulle, ribbons, etc…you will create your very own bunny! $10 will billed to your account. RSVP in your building’s book by Friday, March 29 to be a part of this event. Come join in the fun and win some fun prizes! Get into the mood and join your friends for some good fun! Please bring 2 quarters and 5 dimes. We will play for money pots and prizes! RSVP in your building’s book to be a part of this event by Friday, March 29. This is a basic computer class for anyone who has an iPad, Kindle and laptop who needs to know the basics. THIS is NOT for SAMSUNG Phones! Have you had one of these and not known how to even start with it? This is your class! We will cover the basics on different devices. Please bring your device and any user name and passwords you have so we can get in and work! This class will be limited to the first 15 people who sign up! Please sign up in the Birch dining room to be a part of this event. 2011….PG 13…An all-star cast brings to life the true story of Billy Beane, a former jock turned general manager who uses unconventional methods to bring the best players to the Oakland A’s, a Major League Baseball team struggling against financial hardship. Brad Pitt and Philip Seymour Hoffman star. No need to sign up, just come and enjoy! Bridges Home Health and Hospice is sponsoring a fall risk screen. We will be there to evaluate residents to help prevent a fall in their homes. We will have a PTA that will assess a resident’s gait pattern, and will provide education and give them the tools to be proactive instead of reactive. RSVP in your building’s book to be a part of this event by Monday, April 1. The Rocky Mountain Quilt Museum will be bringing quilts from the Victorian Era! Be sure not to miss this fabulous opportunity to enjoy learning about the craftsmanship of these quilts, the fabric they are made from and the stories about some of these fine pieces. You will be able to touch and see these works of art up close! RSVP in your buildings book by April 2 to be a part of this event. Be sure not to miss this meeting with Mark and your building! He will share any new happenings in the community and answer any questions you have about your building or community issues. PLEASE plan to be in attendance so that everyone gets the correct information! RSVP in your building’s book by the Monday before your meeting. Announcing a new class where those who used to be on the stage can return and those who have always wanted to perform and never had the opportunity can find out what the theatre bug is all about! This is a multi-faceted class where we will cold read plays, scenes and sometimes you will get a part and you and others in your scene will work the scenes up to perform for the rest! This will be a fun way to get to know your neighbors and have a creative outlet! You will learn about the history of theatre, theatre jargon and much, much more! PLEASE consider being a part of this fun, new class! This will be a comprehensive class that meets every week on Thursdays, so please plan to be in attendance each week! No need to sign up, just come and enjoy! The blockbuster musical “Hamilton” has ignited considerable interest in the man and his story. It is quite a story! Join Active Minds as we journey back to our nation’s early history and visit the life and times of Alexander Hamilton, his friends, his enemies, and the principles he fought (and perhaps died) for. RSVP in your building’s book by Wednesday April 3 to be a part of this event. Deb will be conducting a class about ALL Samsung phones! She will show you how to take, store and send photos, how to do facebook, texting, etc….on your SAMSUNG phone only! RSVP in your building’s book by Wednesday, April 3 to be a part of this event. Have you ever wanted to learn another language? Have you spoken Spanish in the past but have forgotten vocabulary and verb conjugations? It’s your lucky day! We will be learning Spanish from the ground up! For some it will be review, for some, something totally new! We will be using Amazon’s “Great Courses” videos which are taught by a Professor from Alabama University. We will stop during the 45 minute sessions and practice what is being taught that day. You are never too old to learn something new! Get your brain in motion and let’s learn a language! PLEASE make yourself a promise that you will come to every class so that you get the maximum experience. This is an ongoing class that we will continue, just like a college class, if you miss a class, there will be no one to catch you up. RSVP in your building’s book by the Thursday prior to each class. Come and enjoy the Rockies first game of the season! We will have peanuts, cracker jacks, hot dogs, etc….. while we enjoy the game on the big screen. Come and enjoy a beautiful spring opener! RSVP in your building’s book by Tuesday, April 2 to be a part of this event. 2013….PG13…This biopic focuses on the relationship between baseball icon Jackie Robinson and Brooklyn Dodgers general manager Branch Rickey, who signed Robinson and in 1947 made him the first black Major League Baseball player of the modern era. Harrison Ford and Chadwick Boseman star. No need to sign up, just come and enjoy! Don’t miss this great show about a zany rich-boy-meets-hometown-country girl romantic comedy based on popular George and Ira Gershwin tunes including “I Got Rhythm,” “Embraceable You,” “Nice Work If You Can Get It,” and “Someone To Watch Over Me”. $26.25 will be charged for middle orchestra seats. There are 2 ADA seats at $32.50 as well. This is a pre-sign up event. If you missed signing up for this event, you can sign to be on the wait list. If you cancel and we cannot find a replacement, you will be responsible for $26.25 or $32.50. Please sign up in the Birch dining room to be a part of this event. Join us for this scrumptious breakfast at a neighborhood favorite! This menu offers omelets, frittatas, pancakes, skillet breakfasts and much, much more! Bring your appetite and let’s have a nice breakfast with friends and neighbors. Please peruse the menu in your book prior to signing up. Breakfast is on your own. If you cancel within 24 hours of the event, you will be responsible for a $5 cancellation fee; $10 if it is a 2 van event. Please sign up in the Birch dining room to be a part of this event. Time for Texas Hold ‘Em!!! Bring $1 and $1 more to buy in again (if you want) for this game of luck, skill and pure POKER!!! NO need to sign up, just come and enjoy! This month Brian will be presenting a menu with 5 or fewer ingredients: zucchini bread sticks, skillet sausage and spring vegetables and coconut cookies. $15 will be charged to your account for lunch. If you cancel and we cannot find a replacement, you will be responsible for $15. Please sign up in the Birch dining room to be a part of this event. 2012….PG13… Slowed by age and failing eyesight, crack baseball scout Gus Lobel takes his grown daughter along as he checks out the final prospect of his career. Along the way, the two renew their bond, and she catches the eye of a young player-turned-scout. Clint Eastwood, Amy Adams and Justin Timberlake star. No need to sign up, just come and enjoy! Don’t miss this wild toe-tapping, head shaking musical tribute to the rockin’ women who made the music of the 60’s so special-everyone from Lesley Gore to Janis Joplin, from the Shirelles to the Supremes, Aretha Franklin to Tina Turner, and every woman in between! Featuring such timeless classics as “My Boyfriend’s Back”, “Be My Baby”, “Proud Mary,” and “Can’t Hurry Love” and much more. Beehive recalls the days of miniskirts, transistor radios and flower power. This concert revue will have you dancing in your seats! $36 will be charged for orchestra seating. If you cancel and we cannot find a replacement, you will be responsible for $36. If you cancel within 24 hours of the event, you will also be responsible for a $5 cancellation : $10 if it is a 2 van event. Please sign up in the Birch dining room to be a part of this event. Let’s welcome Mindy back to Concordia! She is a local singer and performs around the Denver and Boulder areas to much acclaim! She will WOW you with her wonderful voice, singing standards and favorites from the good old days! Please leave your cell phones at home so as not to disturb your fellow concertgoers and the musicians on stage. And please remember not to come any earlier than 15 minutes before the start time. RSVP by Tuesday, April 9 to be a part of this event. This family-owned Italian restaurant has moved into the beautiful, historic Old Stone Church in Castle Rock. Come along and enjoy some good food and a return to a very interesting location! The menu includes: burrata, calamari, mussels, pasta e fagioli, Linguine with clam sauce, Eggplant Florentine, Chicken/Veal Parmagiana, Linguini Carbonara, Gnocchi, Lobster Ravioli and many more family recipes! Please peruse the menu in your book prior to signing up. Lunch is on your own. If you cancel within 24 hours of the event, you will be responsible for a $5 cancellation fee; $10 if it is a 2 van event. Please sign up in the Birch dining room to be a part of this event. 1989….PG…. Kevin Costner stars as an Iowa farmer who hears a mysterious voice telling him to turn his cornfield into a baseball diamond. He does, but the voice’s directions don’t stop — even after the spirits of deceased ballplayers turn up to play. James Earl Jones and Burt Lancaster co-star as a reclusive writer and a young slugger turned doctor, respectively, with Ray Liotta turning in a pivotal performance as “Shoeless” Joe Jackson. Kevin Costner stars. No need to sign up, just come and enjoy! This concert is “From New York”. Featuring Mathew Zalkind, cellist playing Dvorak’s Cello Concerto also Gershwin’s Cuban Overture, Charles Griffe’s The White Peacock and Aaron Copland’s parts of Rodeo. $17 will be charged to your account. If you cancel and we cannot find a replacement, you will be responsible for $17. If you cancel within 24 hours of the event, you will be responsible for a $5 cancellation fee; $10 if it is a 2 van event. Please sign up in the Birch dining room to be a part of this event. Come and enjoy this award-winning restaurant with a menu of scrumptious choices. The menu includes raspberry French toast, chicken fried steak and eggs, omelets, eggs benedict and much more! Please peruse the menu in your building’s book prior to signing up. Brunch is on your own. If you cancel within 24 hours of the event, you will be responsible for a $5 cancellation fee; $10 if it is a 2 van event. Please sign up in the Birch dining room to be a part of this event. Don’t miss this exciting opportunity to see Leonardo daVinci’s incredible inventions! There will be hands on displays and replicas of many of his famous designs including the helicopter, airplane, automobile, submarine! Come see why the ultimate Renaissance man remains an inspiration for the ages! We will also be enjoying the IMAX: Volcanoes, the fires of creation! Where we will travel alongside intrepid explorer Carsten Peter and dodge boulders at the edge of an active volcano in Indonesia and descend to a lava lake in Vanuatu and explore the archaeological ghost town of Pompeii! This will be an exciting day full of discovery and education! $29.25 will be charged to your account for the exhibit and IMAX. Lunch is on your own. If you cancel and we cannot find a replacement, you will be responsible for $29.25. If you cancel within 24 hours of the event, you will also be responsible for a $5 cancellation fee; $10 if it is a 2 van event. Please sign up in the Birch dining room to be a part of this event. April is Volunteer Appreciation month and we surely appreciate our Concordia volunteers! 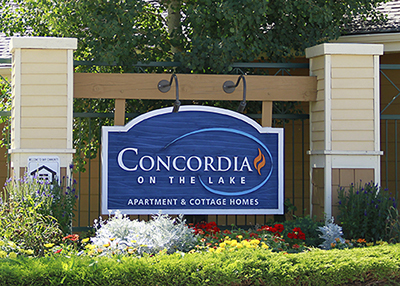 From showing your apartment, to watering plants, to helping run games, to driving extra people to events and more…You are appreciated and Concordia couldn’t do what we do without our wonderful residents! This lunch is by invitation to those who volunteer at Concordia. 2007…PG…Determined to see Pittsburgh Pirates right fielder Roberto Clemente get his 3,000th hit, recently uprooted Pennsylvania brothers Mickey (Trevor Morgan) and Roger (Rory Culkin) make an unauthorized cross-country trek from Los Angeles to Three Rivers Stadium. The fact that Roger has muscular dystrophy is daunting … but it’s hardly a deterrent. Ray Liotta and Lauren Holly co-star in this Tribeca Film Festival selection based on a true story. Cynthia Peer Art History Presentation! This presentation gives a brief history of the artists who created these wonderful works of art, that describe in visual vivid detail the Easter story, from the arrival of Jesus into Jerusalem, to the betrayal, the crucifixion , the deposition and the resurrection, highlighting several favorite artists including Botticelli and Caravaggio. RSVP by Tuesday, April 16 to be a part of this event. Let’s visit BelMar’s newest eatery! This restaurant is a fiesta in itself decorated with bright colors and crazy art…it is FUN to eat here! The menu features all things Mexican fare including enchiladas, burritos, chili rellenos, tamales and much more! Please peruse the menu in your building’s book prior to signing up! Lunch is on your own. If you cancel within 24 hours of the event, you will be responsible for a $5 cancellation fee; $10 if it is a 2 van event. Please sign up in the Birch dining room to be a part of this event. Come join your neighbors in battling for the coveted pizza party! Each building’s residents will answer trivia questions to earn points for their building. The buildings battle against each other to prove which building has the most smarts and that building wins a pizza party! This is a fun time to learn something new and meet new friends. Don’t miss this exciting game of knowledge! A landmark in American drama, Thornton Wilder’s Pulitzer prize-winning play tells the story of a small town in New Hampshire. We follow the Gibbs and Webb families and residents of the town through twelve years of life changes. Through the young lovers Emily and George, their strong and loving parents and many of the town’s locals, Wilder delivers universal truths about what it means to be human. With humor, wit and exceptionally powerful storytelling, “Our Town” offers a unique opportunity to for audience members to realize what it does mean to be human. $22 will be charged for your ticket. If you cancel and we cannot find a replacement, you will be responsible for $22. If you cancel within 24 hours of the event, you will also be responsible for a $5 cancellation fee; $10 if it is a 2 van event. Please sign up in the Birch dining room to be a part of this event. 2012…NR…Based on a true story, unusual circumstances bring a losing high school baseball team to the state championships in this feel-good drama based on a true story. The adolescent underdogs struggle with failure and teen milestones before being granted their chance at glory. No need to sign up, just come and enjoy! Calling all Easter Bunny seekers and believers!!! Yes, it has been reported the Easter Bunny will return to Concordia to visit the residents and their grandchildren, great grandchildren, nieces, nephews, friends, etc… Have a wonderful spring day with your family and friends while you watch the kids’ faces light up at the sight of Peter Cottontail! $10 will be charged to your account for each child attending. This price includes an Easter basket with goodies, a small gift and refreshments. The deadline to sign up in RSVP book is March 15th. If you cancel after this date, you will be responsible for $10 per child as the Easter Bunny will already be on his way with the gift for each child. RSVP in your building’s book with number of children (ages and sexes) and adults by Wednesday, April 17th ! Let’s celebrate our incredible planet as we watch “Planet Earth Pole to Pole” documentary and enjoy refreshments with our earthling neighbors! RSVP by Friday, April 19 to be a part of this event. COMING TO CONCORDIA!!! YOUR VERY OWN CLOTHES BOUTIQUE brought to you! Come and shop your favorite brands, Alfred Dunner, Leon Levin, Coldwater Creek, Chico’s, and much more! Credit cards, checks and cash are accepted and if there is not a size available they can order most pieces. Drop in any time from 12-3:00pm and do some shopping for your Holiday outfit! 1984…PG…Gifted baseball player Roy Hobbs — whose life has taken some unexpected turns — becomes a 35-year-old rookie sensation who helps a cellar-dwelling team get back in the game in this mythic film that’s as epic as America’s national pastime. Robert Redford, Glenn Close and Kim Basinger star. No need to sign up, just come and enjoy! Don’t miss this great opportunity to spend time with friends and neighbors while enjoying some treats! Come and unwind in the company of old friends and new! This is a great way to meet people in the community! Come join in the fun! Breakfast is on your own. Please sign up in the Birch dining room to be a part of this event. Giacomo Puccini, opera’s premier musical dramatist, presents an impression of the lives of ordinary people searching for happiness with “Il Trittico”, his tryptich of one-act operas. In an all-new Lamont production, “Il Tabarro”, “Suor Angelica” and “Gianni Schicchi” create a journey from despair to laughter, building to an unforgettable experience in opera and in theatre. $20 will be charged to your account for parterre seats. If you cancel and we cannot find a replacement, you will be responsible for $20. If you cancel within 24 hours of the event, you will also be responsible for a $5 cancellation fee; $10 if it is a 2 van event. Please sign up in the Birch dining room to be a part of this event. 2013…PG13… To cure his drinking problem, pro baseball star Cory Brand returns to his hometown and begins coaching a Little League team as part of his rehab. After faking his recovery at first, Cory starts to glimpse real redemption in the kids playing for him. No need to sign up, just come and enjoy! Don’t miss this opportunity to spend time with friends and neighbors while enjoying some treats! Come and unwind in the company of old friends and new! This is a great way to meet people in the community! Come join in the fun!! Please RSVP in your building’s book to be a part of this event by Wednesday, April 24 to be a part of this event. The record-breaking musical spectacular by Andrew Lloyd Webber that has captivated audiences in more than 30 countries and 15 languages, is now on tour across North America. Audiences are rediscovering this beloved musical with breathtaking music, including one of the most treasured songs in musical theater—“Memory”. Winner of seven Tony Awards including Best Musical, Cats tells the story of one magical night when an extraordinary tribe of cats gathers for its annual ball to rejoice and decide which cat will be reborn. The original score by Andrew Lloyd Webber (Phantom, School of Rock, Sunset Boulevard), original scenic and costume design by John Napier (Les Misérables), all-new lighting design by Natasha Katz (Aladdin), all-new sound design by Mick Potter, new choreography by Andy Blankenbuehler (Hamilton) based on the original choreography by Gillian Lynne (Phantom) and direction by Trevor Nunn (Les Misérables) make this production a new Cats for a new generation. This is a pre-sign up event. $33 will be charged to your account. If you cancel and we cannot find a replacement, you will be responsible for a $33. If you cancel within 24 hours of the event, you will also be responsible for a $5 cancellation fee; $10 if it is a 2 van event. Please sign up in the Birch dining room to be a part of this waitlist. Come on, Ladies, come enjoy a wonderful breakfast with friends and neighbors. The menu includes omelets, pancakes, French toast and several egg breakfasts. There is always some sort of pancake special and loads of great food! This is a great way to meet new friends! Come and enjoy the most important meal of the day! Breakfast is on your own. Please look at the menu in your building’s trip book to view the options before you sign up! If you cancel within 24 hours of the event, you will be responsible for a $5 cancellation fee; $10 if it is a 2-van event. Please sign up in the Birch dining room to be a part of this event. Come and enjoy creating with Deb! You will be creating a May basket to hang on one of your favorite neighbor’s doors! $10 will be charged to your account for the materials. RSVP in your building’s book by Friday, April 26 to be a part of this event. Come and enjoy meeting new neighbors, having an afternoon drink and playing pool! Everyone is welcome! This will be a fun way to celebrate the new year! Who knows, maybe this will become a habit! Please join us for fun! Appetizers and Drinks are on your own. It is happy hour so there are great deals! Pool is free, so come and play!!! If you cancel within 24 hours of the event, you will be responsible for a $5 cancellation fee; $10 if it is a 2 van event. Please sign up in the Birch dining room to be a part of this event. Come enjoy a fun, dice game with all your friends! Bring 4 quarters and a fun attitude and that’s all you need! NO need to sign up, just come and have fun! 1992…PG…Two small-town sisters join an all-female baseball league formed when World War II brings professional baseball to a standstill. As their team hits the road with its drunken coach, the siblings find troubles and triumphs on and off the field. Tom Hanks, Geena Davis and Madonna star. No need to sign up, just come and enjoy! Be sure to join us for this wonderful evening at a seafood favorite! The menu boasts many fresh seafood choices from fresh oysters, mahi mahi, rainbow trout to king salmon. There is also lobster and king crab on the menu! Please take a look at the menu in your building’s book for menu choices. Dinner is on your own. We need 10 signed up to go on this event. If you cancel within 24 hours of the event, you will be responsible for a $5 cancellation fee; $10 if it is a 2 van event. Please sign up in the Birch dining room to be a part of this event.